Words from the man himself, Charlie Woodward. Wheels Through Time is excited to introduce the 2018 Raffle Grand Prize winner. This year’s lucky winner is Charlie Woodward of Allons, TN who is the proud new owner of a genuine 1936 Harley-Davidson Knucklehead! On Sunday, November 25, Charlie and his Wife Tammie stopped by Wheels Through Time for Charlie to pick up his new motorcycle. While he was here, we had the opportunity to sit down with Charlie and find out a little more about him. Charlie first learned about Wheels Through Time after a recommendation from his friends, who knew of the museum and Charlie’s love of motorcycles. The encouraged he and his wife to take a trip to tour the museum, and the rest is history. Charlie’s lifelong love of motorcycles was sparked by his dad, who rode a 1967 Harley-Davidson FLH. When his dad passed away 30 years ago, he left the bike to Charlie. He still rides it on a regular basis today. Charlie also owns a 2006 Harley-Davidson, which he’s taken all over the country, including a 4000+ mile trip through the western U.S. When Charlie and Tammie made their first visit in July of 2018, they immediately fell in love with the Wheels Through Time experience. After spending several hours touring the facility, they wanted to help support what was happening at the museum. 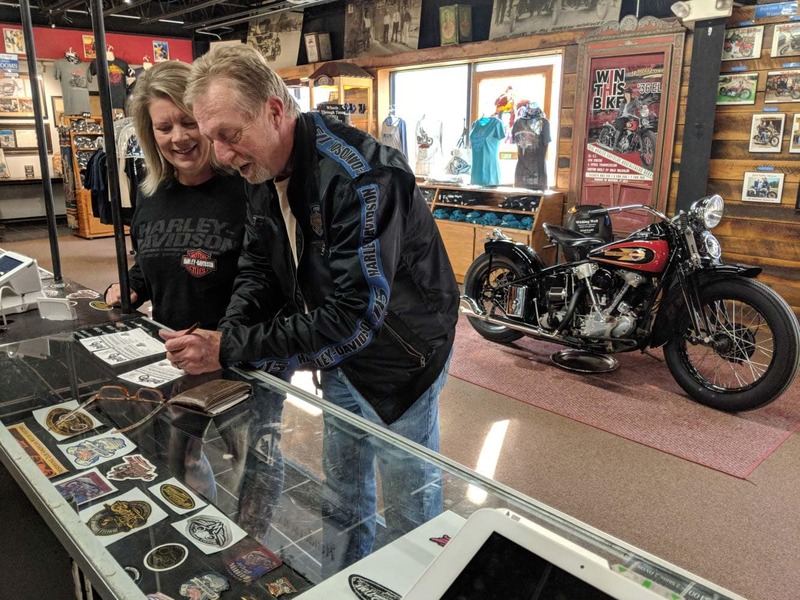 The annual raffle is WTT’s biggest fundraiser, so for Charlie, it was a no-brainer — he could support the museum and have a chance to win a classic motorcycle. A lot of people think that in order to have a chance to win the annual raffle that you have to have a lot of tickets in the pot. Charlie is an excellent example of how that isn’t necessarily the case. Having recently entered and won his local Rotary Club’s raffle with the purchase of only one ticket—a decision that sent him home with a brand new 2017 Camaro—Charlie decided to purchase only three tickets, hoping his good luck would continue. When the winning ticket was drawn, perhaps no one was more surprised than Charlie. Charlie buying 3 tickets for the 2019 Raffle Bike. Matt with Charlie and wife Tammie along with the 1936 Knucklehead. When his phone rang just after 2:00p.m. that Saturday afternoon, not recognizing the number, Charlie let it go straight to voicemail. After a second, and a third straight call, museum curator Dale Walksler left him a message announcing the big news. When he got the message just a few minutes later, he was in shock, but somehow managed to call the museum back to claim his prize. When he arrived at the museum this past Sunday and walked in to look at his motorcycle Charlie was in awe. Over and over again he stated how he still couldn’t believe that he was the winner and that the bike now actually belonged to him. He said that winning a 1936 Harley Davidson has been exciting for many reasons, firstly, because he always wanted to own and ride a motorcycle with a foot clutch and tank shift. His mother was also born in 1936, so the machine now holds a special place in his heart. He plans to keep the machine and ride it regularly. In fact, one of his first priorities is to find a proper buddy seat and passenger pegs so he and Tammie can put on miles together. After looking over the bike, Dale’s son Matt walked Charlie through the particulars of a classic Harley, starting procedure, clutch and shifter operation, and routine maintenance needs. Now it’s all up to Charlie—all that’s left to do is ENJOY! Before he and Tammie left, Charlie made sure to try his luck again, buying three tickets for the 2019 Raffle. Next years Grand Prize…another 1936 Knucklehead, this time finished in black with a traditional hot-rod bobber style. He also began the process of becoming a Wheels Through Time Lifetime Donor. Congratulations again Charlie!! Ride On!